Long before My Very Educated Mother Just Baked Us Nine Pies became a handy mnemonic device to remind children of the names of the various planets…long before the planets themselves… there was nothing but an inky void filled with gas, dust, ice, and charged particles. Over time, these mixed and mingled to create the foundations for what would eventually become planets. 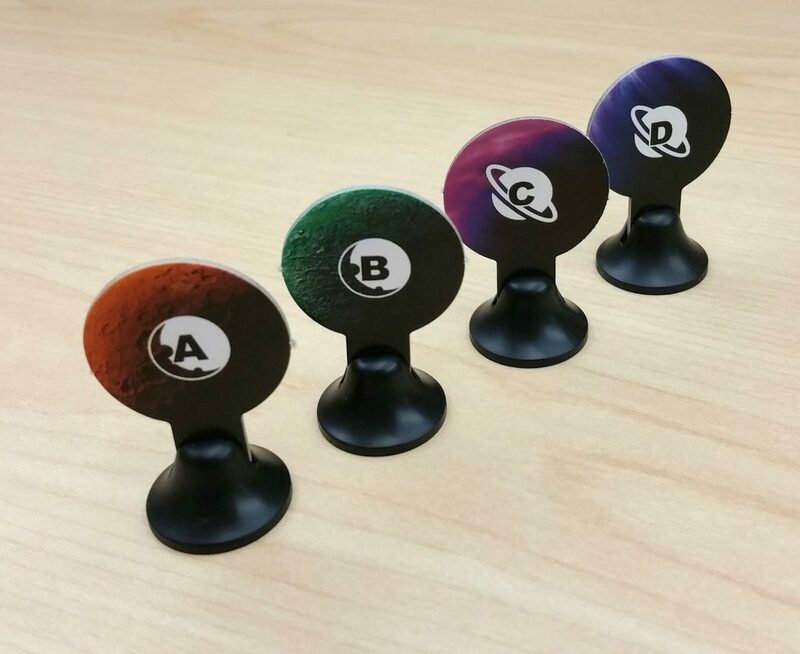 The game of Planetarium drops the players into the middle of an embryonic universe and puts them in control of the forming and evolution of four planets. 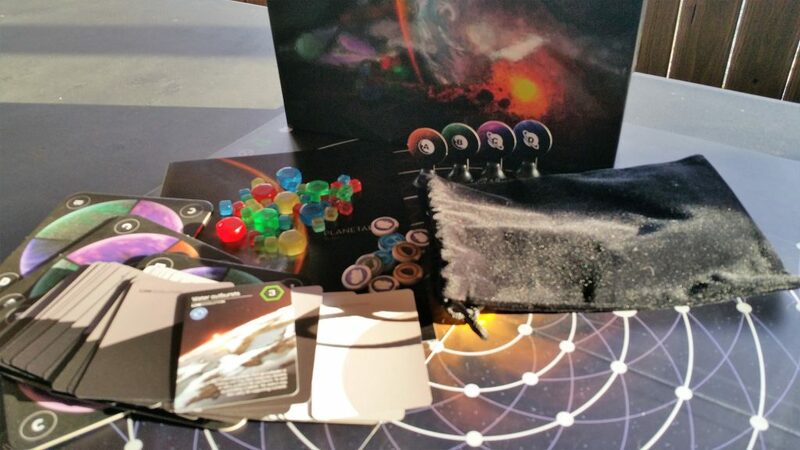 The galaxy is loaded with matter tokens and players will take turns collecting these tokens in an effort to complete the requirements on the cards that they will be holding in their hands. Completed cards earn the players victory points. The player with the most victory points at the end of the game wins. Opening Planetarium is an adventure. It’s a very well crafted game and a real feast for the eyes. The game comes packaged in a very sturdy box that has been lovingly illustrated by Greg May. There is a planet in the foreground undergoing a very violent and awe inspiring metamorphosis. It is unclear whether something has crashed into the planet or whether something is escaping from it. Regardless, it is truly a marvel to behold. Greg May’s artwork all throughout the game is phenomenal and the boxtop immediately sets the stage for what awaits you inside. Open the lid and you’ll find a plethora of tokens divided into four types of matter (gas, water, rock, and metal), four habitable/hostile tokens, and four planet tokens. Additionally, there are three different decks of cards (low evolution, high evolution, and final evolution), several player boards, a small collection of translucent cubes and hexagonal markers in four different colors, a sleek rulebook, and the game board itself. 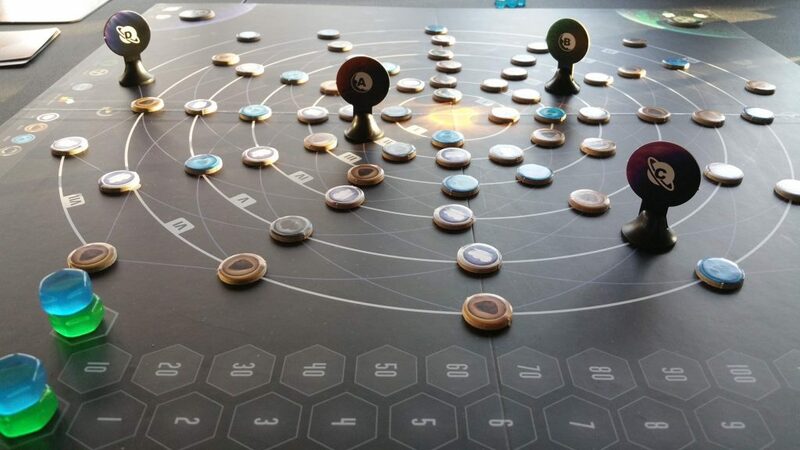 The game board depicts a sun surrounded by circular orbits. There are seven orbit levels in all. Each one is labeled with a Roman numeral. In between each orbit are paths that tokens can utilize to move up and down orbit levels. The components are all of very high quality. The tokens and player boards are nice and sturdy. The cards are thick and have a smooth linen finish. The cubes and hexagonal pieces are chunky and have a nice tactile feeling about them. There certainly weren’t any corners cut during the production of this game and it shows. As previously mentioned, there are three different decks of cards which are split into three different types: low evolution, high evolution, and final evolution. The layout of these cards is standard across all of the different types. At the top of the card is the name of the card and the card type. At the bottom of the card is an interesting factoid about planets and planet formation. In the top right corner is the card’s value surrounded by either a green or a grey hexagon. On the left hand side is the card’s cost. The value in the hexagon is important for two reasons – it determines how many victory points the person that plays it receives for playing the card and it also helps to determine whether the planet to which the card has been played will become either habitable or hostile (more on this in a bit). Low evolution cards are the easiest to play and typically worth fewer points while high evolution cards are the opposite – more expensive and worth a greater number of points. The final evolution cards can only be played at the end of the game. The cost to play the planet is shown as a series of symbols. These symbols show some combination of matter tokens that must be traded in to place the card or dictate that the planet the card is being played to must be a specific type of planet or even which orbit level the planet must be in (final evolution cards only). Sometimes it’s just one or two of these, but sometimes it’s a heady combination of all of them. Some of the cards contain a couple of special symbols. 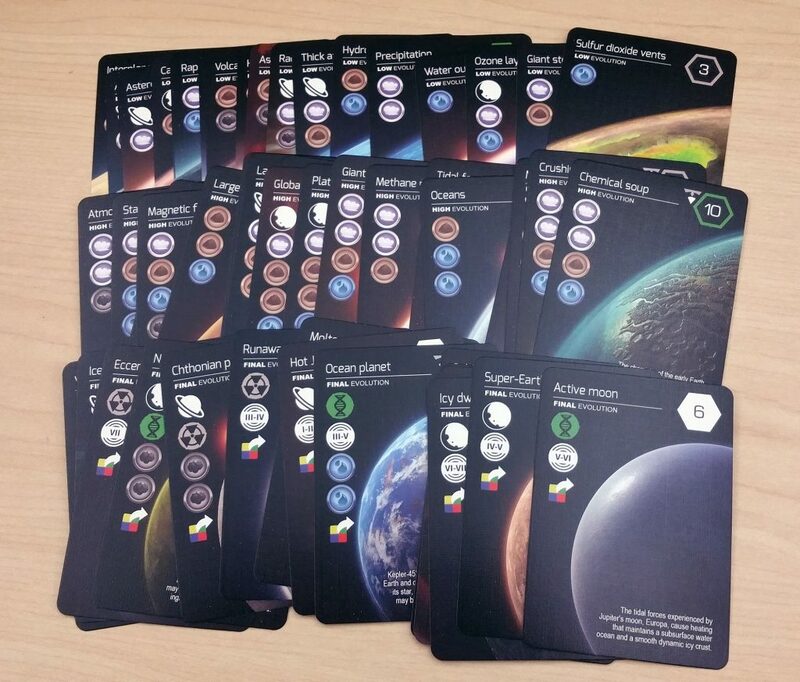 One, the gravity symbol, allows a player to immediately take a matter token from anywhere on the board and add it to any of the planet areas on their player board. The second, the downgrade symbol, gives the player the ability to (instead of playing the card) discard the card and draw a new low evolution card to replace it. The game board is laid out and the matter tokens are placed face down (or into a bag) and shuffled. Then, one by one, the tokens are placed face up onto the little dots that appear on the various orbits. The planets are placed onto their marked starting spaces. Planet A goes on top of the A space, for instance. Next, each player selects a color. They place their scoring tokens onto the zero spaces of the scoring track and their control cubes are kept in front of them along with a player board. After they have gathered up their tokens, every player is dealt 2 low evolution, 2 high evolution, and 2 final evolution cards. They will select a final evolution card to hang onto and one to discard. A starting player is selected and you are ready to begin. Each turn in Planetarium consists of players performing one mandatory token movement action followed by an optional card playing action. When performing the token movement action, the players has two choices: move a planet or move a matter token. When moving a matter token, the token must move along the track clockwise and can only move one space at a time. Matter tokens can never occupy the same space as another matter token nor can they pass through other matter tokens. 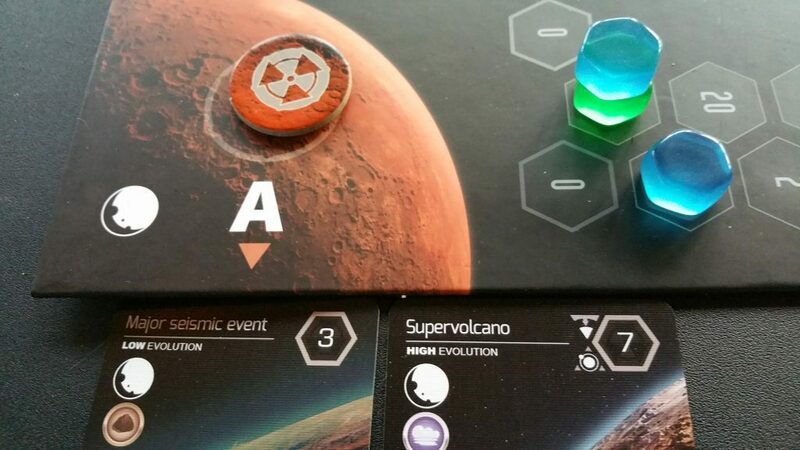 If the matter token collides with a planet, the player collects the matter token and adds it to their player board in the space that matches the planet that the token crashed into. For instance, if the player crashed a water token into Planet B, then they would take that water token and add it to the Planet B area of their player board. During the matter token movement, the matter token can change orbit level if the player so chooses. Planets have their own special rules. Unlike matter tokens, planets can move clockwise around the track as many spaces as they want until they collide into a matter token. They can even pass through other planets. 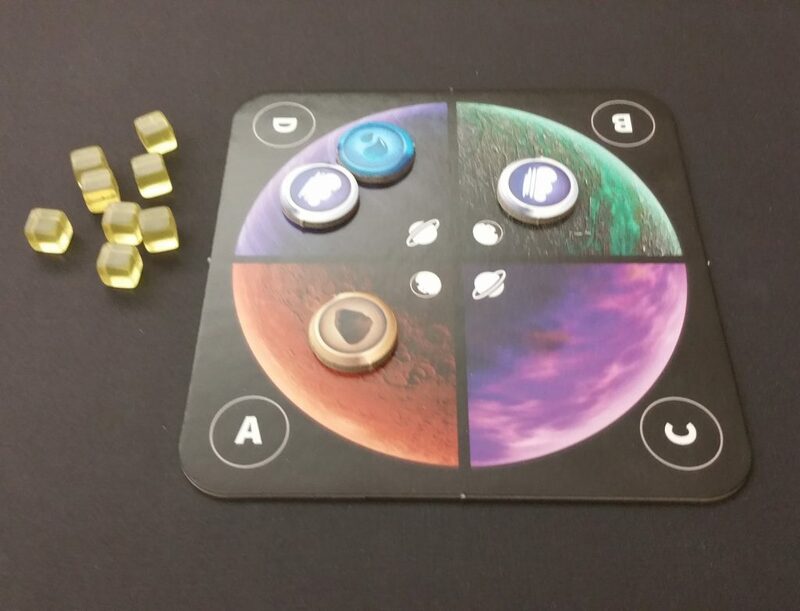 When they eventually collide with a matter token, that matter token is collected and placed onto the player board in the space that coincides with the planet that crashed into it. So, if a player crashes Planet D into a gas token, the gas token is placed into the Planet D space on their player board. After the player has moved a token, they will have the opportunity to play a single card from their hand. If they are able to meet all of the conditions on the card, they will remove the required matter tokens from a single planet section of their player board and then play that card next to that planet’s card area along the edge of the game board. Then they will place one of their control cubes onto the card if they so choose. If a player runs out of control cubes, then they have the option to remove a control cube from a card that they already control that has been played and place it on top of the new card. 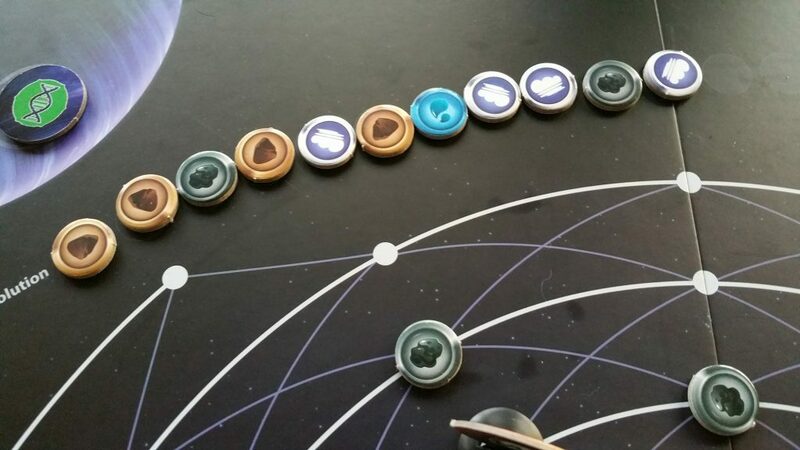 The matter tokens used to pay for the card’s cost are placed on the Evolution track that runs along the edge of the board. If the players place a matter token onto the double arrow space of the Evolution track, then this signifies that matter tokens may now move a total of two spaces instead of just a single one. 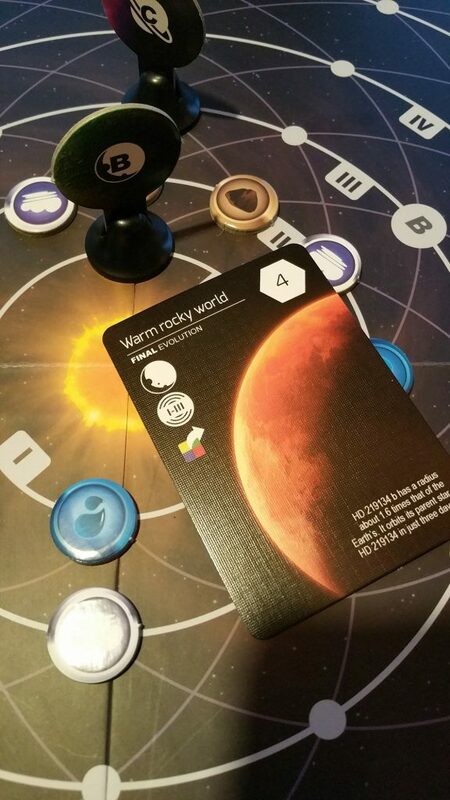 Once the matter tokens have been added to the track, then the player will determine whether or not the planet the card was played to is hostile or habitable. If the numbers in the green hexagons, when added together, have a value higher than the numbers in the grey hexagons, then the planet will be habitable. Otherwise, the planet will be hostile. If the player has played a card, then they must draw a new card from any of the piles and add it to their hand. If they draw from the final evolution deck, they will draw two cards, choose one to keep, and discard the other. The player should exercise caution when doing this, though, as final evolution cards cannot be played until the game ends. Whenever a player places a matter token into the final circle of the Evolution track, the final rounds of the game are triggered. The player that placed the token now has the opportunity to play as many final evolution cards as they can. Then each other player gets one more final turn in which they will be able to move a token and then play as many low, high, and final evolution cards as they can. When playing final evolution cards, the player must be able to remove a control marker from another card that has already been played to that planet. So, if you did not have any cards played to Planet A with your control marker on them, then you would not be able to play a final evolution card to it. And, like virtually every other game in existence, the person with the highest score at the end is the winner. Firstly, I said this earlier and I want to reiterate it, this game is beautiful. It truly is a work of art. In fact, that’s what initially drew me to it. Greg Mays’s exquisite illustrations really help bring the game to life. When you first open the box, you’ll probably spend more time just staring at the artwork on the cards than you will actually learning to play. The little informational tidbits on the cards is just the icing on the cake. I really enjoy games that are educational in some way. Games like A Feast For Odin, Lewis and Clark, or Key to the City: London give you loads of interesting historical information about the universe those games take place in and this game is no different. The last few pages of the rulebook provide information about how solar systems are created and about the ongoing search for life on other worlds. None of this is needed to play the game, but it’s just really, really nice to have that little bonus. The odd thing about Planetarium is that its singular weakness is also one of its greatest strengths. It’s a very simplistic game. Move a token. Play a card. There’s not much to it and that’s great when you’re teaching a game to a person that’s never played it before. The problem with the game’s simplicity, though, is that it feels, at times, like it’s TOO simple. Because of this, the game can feel like a roll and move sort of game at the very beginning and it’s almost enough to make you want to throw in the towel. And then things begin getting interesting. As the matter tokens begin to disappear, the token movement options begin to become more important. You’ll move a planet into a new orbit to collect a matter token, for instance, and then your opponent will make it a point to move the planet back into the orbit in which it originally resided. This is a clear indicator that they’re trying to put things into place to complete one of their final evolution cards, and it becomes a challenge to try to manipulate things in such a way as to block them from playing their card while advantageously being able to play yours. There’s also a delicate balance that you’ve got to find between holding low and high evolution cards in your hand along with final evolution cards. Since those final evolution cards stay in your hand until the end of the game, it is possible to clog up your hand with cards that will be useless for most of the game. So, do you go with a strategy of playing lots of smaller cards to earn points throughout the game or do you go with a strategy of working towards multiple final evolution cards as your end goal? Or do you try to go with a more hybrid strategy of doing a little of both? The truth is, there’s no best answer. And that’s one of the things that make this game really great. When I first read through the rules, I was prepared for disappointment. The simplistic gameplay left me feeling like I’d probably spent my hard earned money on a dud (albeit a VERY attractive one). Thankfully it didn’t turn out that way. Planetarium is an amazing game, and I’ve really enjoyed playing it every time that I have had the opportunity to do so. This is an excellent game for families and friends alike. It’s the kind of game that uber gamers and casual gamers can both really sink their teeth into. I give this game a major thumbs up! What do you think about Planetarium? Give us your opinions about what you like and/or dislike about the game in the comments below!